RTC#2 - Dad, Can I Have A DVD Player? Dad, Can I Have A DVD Player? One of the joys of DVD's is the alternate commentary track, where often the director or some other supreme being shares behind the scenes dirt that provides insight into the art of filmmaking or justifies your hunch that the director was, indeed, a moron. In this column, we share the meaty info for those of you who are "digitally handicapped". 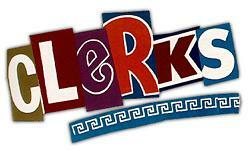 This issue: Kevin Smith's foul-mouthed opus, Clerks. Kev's cousin, Walt Flanagan, plays no less than 5 roles, earning him the moniker, "the Lon Chaney of indie film". The cancer-ridden lung that the cigarette man pulls out is actually a piece of tripe, rubbed in dirt, dabbed with cigarettes. 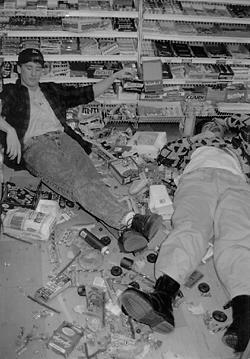 Thirteen minutes of footage was excised between Clerks' debut at Sundance & its Miramax theatrical release. The character of "Caitlyn" is an homage to Canadian after-school spank-fest, Degrassi Junior High. The dead guy's erection under the coroner's blanket is actually a Hershey's bottle with Kleenex taped to the top. Besides having producers Scott Mosier & Sean Jacks assisting him in commentary, Kevin also brings Jason "Jay" Mewes along for the ride. Unfortunately, Mewes is lit up like a Christmas tree and spends most of the running time on the floor, yelling out the occasional drunken epithets, grunting, and at one classic point, snoring.